Mohawk Smart Select Luxury Vinyl Review | Floors, Flooring, Carpet and More! Mohawk Smart Select is a next-generation of LVF planks that is driving demand with consumers making this flooring product the obvious choice for projects. Mohawk Smart Select is expanding your options with new collections of Mohawk Smart Select Luxury Vinyl Flooring. This collection, available at American Carpet Wholesalers of Georgia, offers the versatility to pair the perfect color with the desired level of comfort. Another advantage to this collection is the flexibility to choose how the product will be installed. Mohawk Smart Select can be installed as a traditional glue-down application, float with Uniclic technology or combine the two to save both time and money. LVF floors are incredibly tough. Made from materials designed for high-traffic and everyday life they are virtually impossible to scratch or dent. These are all tangible benefits that will make Mohawk Smart Select a perfect choice for your flooring needs. Mohawk Smart Select was developed for light-to-medium commercial and medium-to-heavy residential use. Smart Select comes with a 15 to 25 Year residential warranty (or 3 to 6 year commercial warranty) depending on the style selected. The Smart Select Collection style Tailor Made in Tobacco Bark – shown to the left – has a 25 year warranty. Smart Select combines durability and performance as well as creating a soft and warm feel underfoot. Mohawk Smart Select luxury vinyl tile is easy to maintain—routine. Sweeping and wet mopping keeps the floor looking new. It is perfect for kitchens, laundry rooms, playrooms, bathrooms, entryways, offices, basements, living rooms, hallways, and mudrooms. Mohawk Smart Select has its own transition and trim packages. The Mohawk moisture resistant molding provides the functionality of a T-Molding and Reducer in a single, easy to install, piece. The unique flexible zone design of the track allows installation of the profile on either direction, thus eliminating the guess work out of positioning the trim. 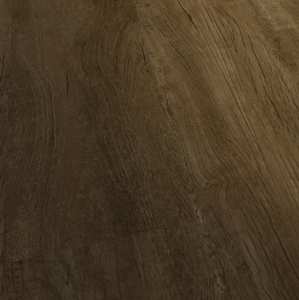 The surface material is highly resistant rigid PVC meant to complement your luxury vinyl flooring. 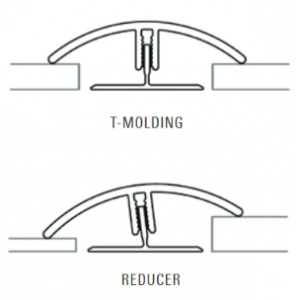 A T-Molding is designed to accommodate the expansion gap between floors of equal height. A Reducer is designed to accommodate the expansion gap between floors of unequal height. American Carpet Wholesalers carries a great selection of Mohawk Smart Select luxury vinyl plank and the pricing is very competitive. Give the flooring experts at American Carpet Wholesalers of Georgia a call. They can ensure you get the best deals when you call. The number to call is 800-548-2706.